Cisco laid out their merchant hardware in a CiscoLive! talk in July 2016. The trident2+ 5001 and 5002 were introduced in November 2015. The Setup and Installation Guide was first published in December 2015. The Tomahawk NCS 5011 seems to have surfaced in March 2016. Cisco positions these guys as aggregation devices. 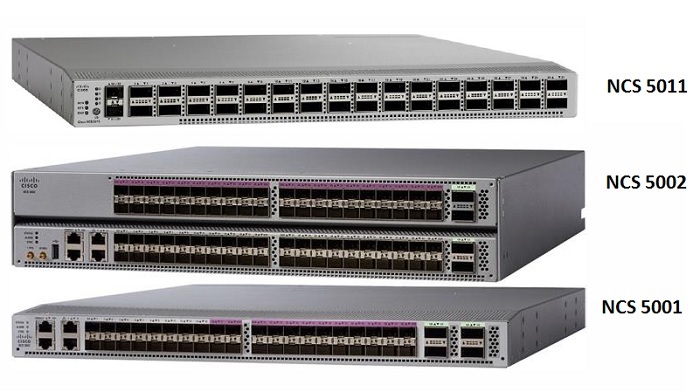 The 5001 and 5002 don't seem other Broadcom Trident2 products because they use the 2+ version of the switch chip along with a gearbox for the 100 Gb/s ports. Packet buffer for the 5001 and 5002 are listed on the data sheet.